With recession risk now at its highest level in a decade, we felt the need to warn readers about the biggest mistake real estate investors can make. Hopefully, this article can help you avoid a costly mistake that might prove devastating to your long-term financial dreams. The Bureau of Labor Statistics reports on the unemployment rate, that often peaks after the recession ends because it is a lagging economic indicator. Most employers wait until they are sure the economy is back on its feet again before hiring permanent employees. The last recession, many refer to as the great one, was the worst since the 1929 Depression. 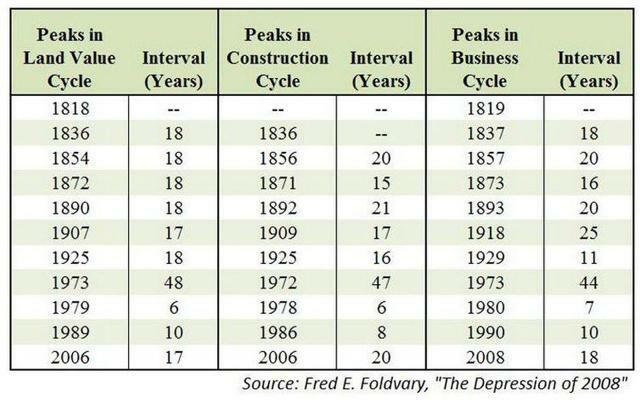 It was also the longest since the Depression, lasting 18 months. As most of you recall, the trigger for the last recession was the subprime mortgage crisis that created a global banking credit crisis. That “great recession” also created a global bank credit crisis in 2007 and by 2008, the credit crisis had spread to the general economy through the widespread use of derivatives. The economy shrank in five quarters, including four quarters in a row (2 quarters contracted more than 5%). In Q4 2008, GDP was -8.4%, worse than any other recession since the Great Depression. 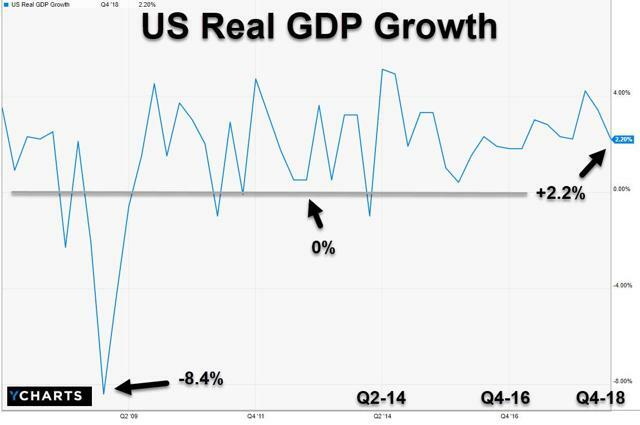 The recession ended in Q3-09, when GDP turned positive, thanks to an economic stimulus package. 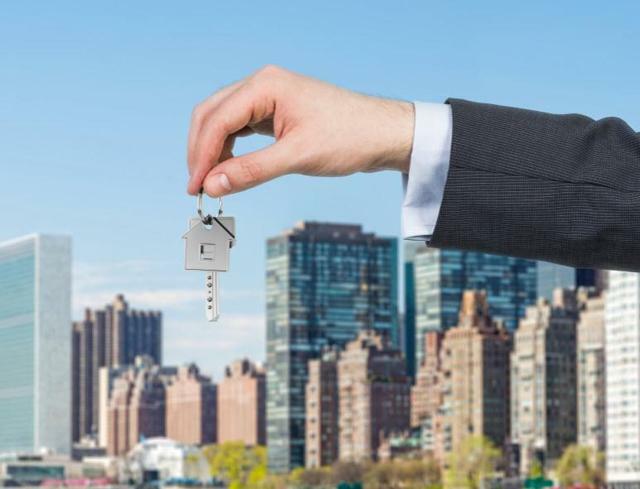 With recession risk now at its highest level in a decade, we felt the need to warn readers about the biggest mistake real estate investors can make ahead of a potential recession in 2020. Hopefully, this article can help you avoid a costly mistake that might prove devastating to your long-term financial dreams. Where this becomes important for long-term income investors, especially those nearing retirement, is in having the right asset allocation to meet your needs in a recession. 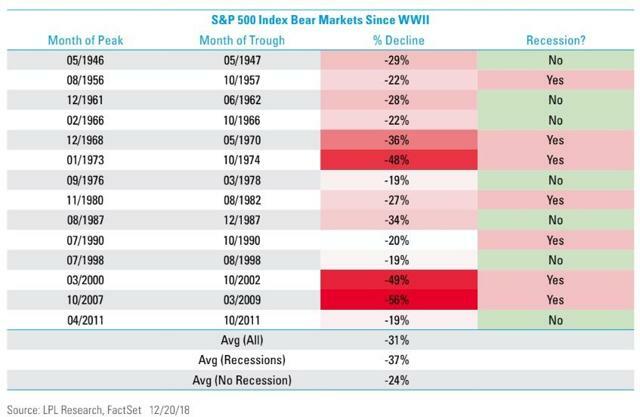 Since WWII there has never been a U.S. recession without a bear market. Recessionary bear markets tend to see stocks fall for about 13 months before bottoming 37% from all-time highs. They then typically take about 22 months to recover to new highs, meaning the average bear market lasts three years from market peak to market peak. 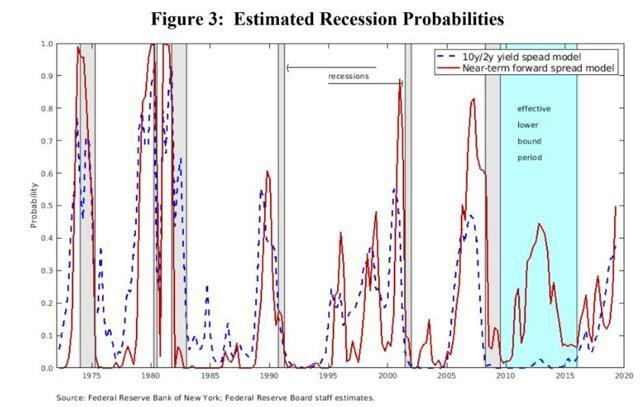 According to a February 2019 study by the New York Federal Reserve, based on its recessionary model (that uses several forms of the yield curve, the best recession predictor in history) the probability of a recession starting within 12 months hit 50% in January. That’s the highest level in a decade. While 50% is basically a coin flip (and thus no reason to panic and do something stupid like selling all your stocks) it’s still a good idea to review your portfolio’s asset allocation and construction to make sure you are prepared if a bear market is coming relatively soon. If you are too stock heavy, then use 2019’s strong market rally (best Q1 in 10 years) to sell stocks at a profit and re-balance into more cash/bonds. You want to have enough cash/bonds (you can use ETFs to make this simple) to pay living expenses (such as in retirement and factoring in Social Security and any pensions you might have) or to augment your emergency fund in case you lose your job and remain unemployed for a long time. As you can see, during the last three recessions cash (T-bills) remained stable or increased in value. Long duration US Treasuries went up significantly more. That’s because the longer the duration of a bond, the more rate sensitive it is. Thus, when interest rates fall during recession long bonds tend to appreciate a lot due to both falling rates and a flight to safety (plus any central bank quantitative easing that might occur). Which brings me to the potentially disastrous idea of using REITs (or any dividend stock) as a bond alternative. While REITs tend to be lower volatility assets over time, they still tend to decline in price during most recessions. Thus, if you need to sell assets to meet expenses, owning too many REITs (and too few bonds) means risking becoming a forced seller at a time when even blue-chip REITs might be selling at fire-sale prices. But it’s not just REITs that make poor bond alternatives, it’s all dividend stocks! Even the famous dividend aristocrats, literally the bluest of blue-chips, tend to fall during a recession. They tend to fall far less (18% less volatile than S&P 500 over the past 28 years), but they almost always decline in value. 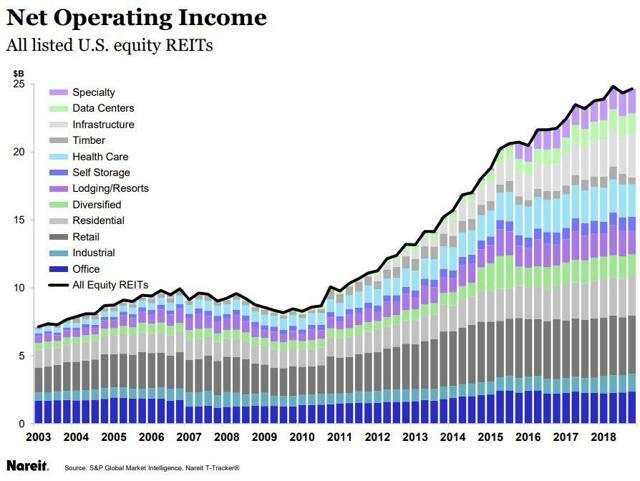 The one exception was during the tech crash (and mild recession of 2001) where most dividends stocks, including many REIT’s like Realty Income (O) soared. 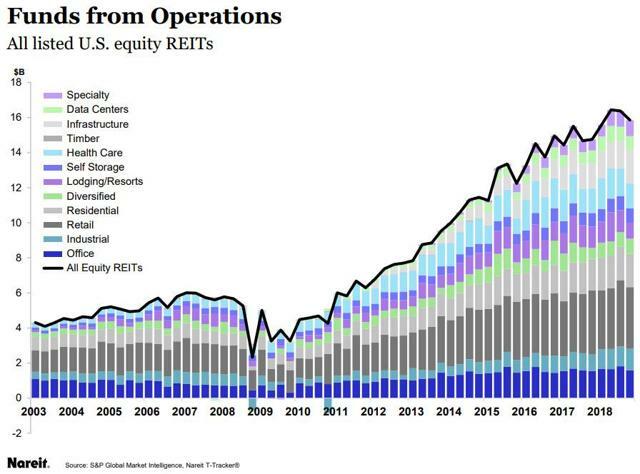 But that was a historical fluke caused by so many investors piling into high flying tech stocks that blue-chips like Realty Income were trading at under 8x FFO in April of 2000. That’s half the REIT’s historical average. 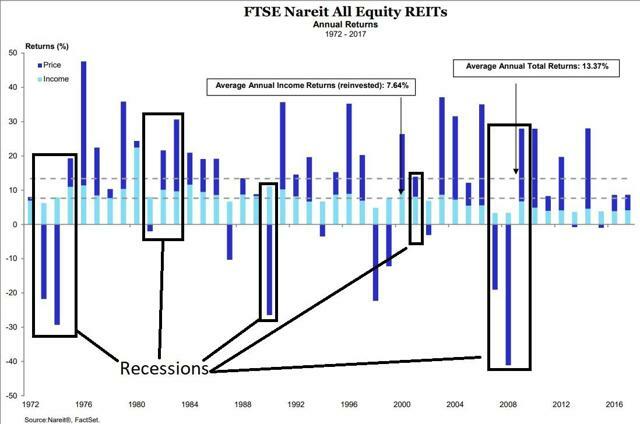 During the tech wreck, when the Nasdaq fell 80% before bottoming, blue-chip REITs like Realty saw their valuations revert to historical levels (15.4 in the case of Realty in October 2002). The same was true for many aristocrats and value stocks, which started the tech crash so undervalued that they actually did act like bonds and moved in the opposite direction of crashing stocks. But that’s not typical and largely a result of valuations reverting to historical means. However, today REITs are trading at about 19x FFO, which is about fair value, historically speaking. And blue-chip SWANs like Realty are trading at about 23x cash flow, which is roughly 20% historically overvalued. Thus, anyone betting their future (and the ability to pay the bills) on the idea of selling blue-chip REITs at a profit during a bear market is potentially risking financial calamity. What about the idea that REITs are likely to rise in a recession because interest rates might fall, perhaps to even lower rates than last time thanks to future Fed bond buying? Well, again, I must point out that REITs (and all dividend stocks) ARE NOT BONDS. While REITs (and dividend stocks) can become rate sensitive in the short to medium-term (especially if interest rates go to historical extremes) over the long-term REITs have virtually no correlation to 10-year yields. 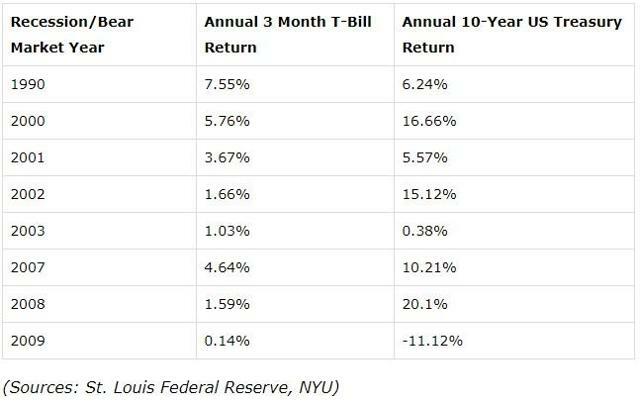 From 1972 to 2017 long-term interest rates explained just 2% of REIT total returns. Think of it like this. If dividend stocks (including REITs) really were good bond alternatives than recessions would see these investments deliver the best returns. And when the economy was growing rising interest rates would cause stocks to suffer. Instead, stocks (including REITs) do best when the economy is thriving and tend to tank when it’s contracting. That’s because stocks ARE NOT BONDs and their intrinsic value is predominantly based on cash flow, and not interest rates. Basically, if you want to actually sleep well at night during the next recession make sure your entire portfolio is recession-proof. That means owning the right collection of quality dividend stocks. But don’t forget that no matter how high quality the companies you may own, most will fall during a recession. If you need stable/appreciating assets to sell in order to pay the bills (like retirees living on the 4% rule) you actually need to own the appropriate amount of cash/bonds. Back in the 30's a real estate economist named Homer Hoyt discovered that real estate prices seemed to ebb and flow on an almost perfect 18-year schedule. Hoyt's theory was later used and refined by now famed economist Fred E. Foldvary to predict the real estate crash of 2008. I'll get into more depth about "The Great 18-Year Real Estate Cycle" shortly, but to me the important part isn't necessarily the 18-year time frame, it is understanding that real estate market operates in a fairly predictable cycle that can be seen and taken advantage of by smart investors. One of the most interesting observations with the chart above (used by Fred E. Foldvary - in his now famous report) was that the 2008 prediction was right in line with the 18-year cycle - which Foldvary uses as the basis for his report. Foldvary observed that Hoyt's 18-year cycle theory diverged so drastically between 1925 and 1973 and he points out that the cycle does not always function on a precise 18 year schedule, but - baring catastrophic events like a world war - for the most part the cycle should be right around 18 years. 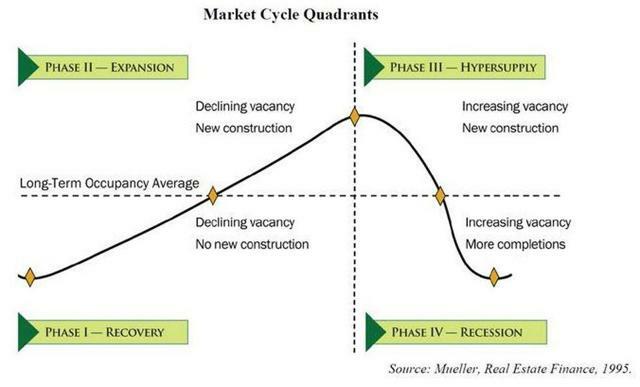 Investors must recognize the importance of understand real estate cycles, because while most stock prices follow the business cycle - which traces changes in general economic activity as measured by GDP, income, employment, industrial production, sales, and the like- real estate business cycles are over three times longer due primarily to the difficulty of construction (planning, zoning, permitting, construction, and lease-up). 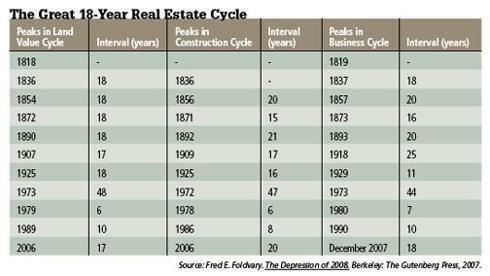 As illustrated below, Hoyt’s 18-year real estate business cycle provides evidence that the brick and mortar asset class has a high degree of predictability, with just two exceptions (WWII and the mid-cycle peak created by the Fed doubling rates in 1979), the cycle has maintained the same level of predictability that Hoyt observed. 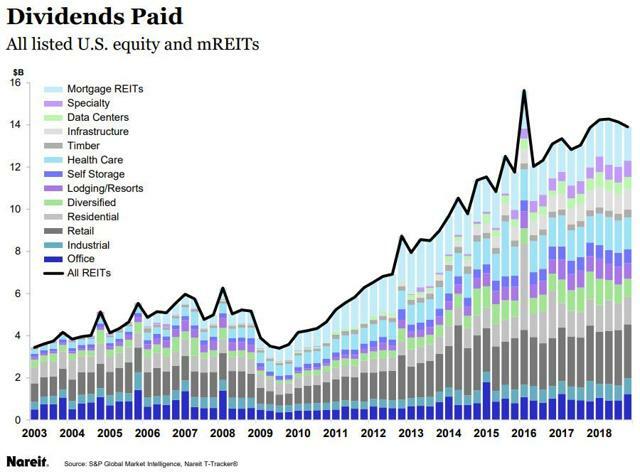 Remember, it has been around 11 years since the last peak and 10 years after the crash and now we see that U.S. real estate is seeing strong occupancy growth, solid earnings growth, and robust construction activity. 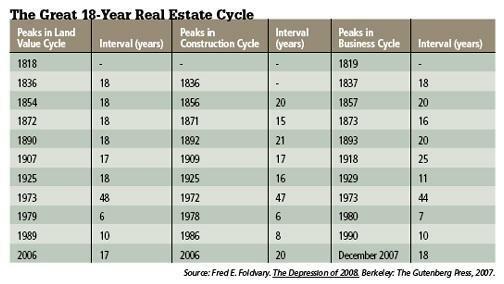 If Hoyt’s math is right, there’s another 7 to 8 years of growth until we see another real estate correction. In baseball terms, we are at the top of the 7thth inning. 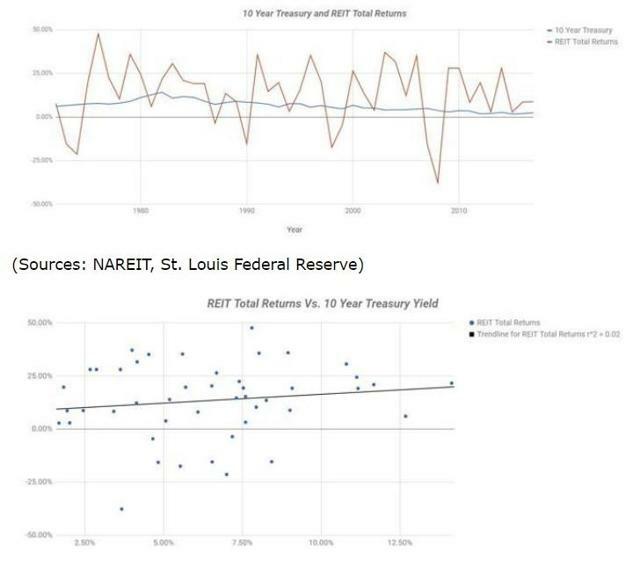 To validate that theory, just take a look at NAREIT’s T-Tracker that illustrates the quarterly performance of the U.S. REIT sector that monitors Funds from Operations (or FF), Net Operating Income (or NOI), and Dividends for all U.S. listed equity and mortgage REITs. One of the biggest mistakes that investors make (in my opinion) is to run from stocks just because the crowd is running away. Over the years (actually decades) I have witnessed multiple recessions – as a developer and investor – and I have found the best opportunities can be found by not following the crowd. Over the next few weeks I intend to commence a “lessons learned” series in which I will examine some of my biggest mistakes and failures. By examining my adversity, I hope to help readers gain valuable insight into my extreme conservatism that has given me a definitive competitive advantage (as a REIT analyst) and is the primary reason that I sleep well at night. Disclosure: I am/we are long O. I wrote this article myself, and it expresses my own opinions. I am not receiving compensation for it (other than from Seeking Alpha). I have no business relationship with any company whose stock is mentioned in this article.